Marine Scrubber Systems Market size in 2017 was valued over USD 800 million and is anticipated to grow over 2,000 units by 2024. Global marine scrubber systems market is set to witness growth owing to increasing sulphur emission from ships coupled with growing concern toward the maritime pollution. As per the International Maritime Organization (IMO) norms, ships are required to limit sulphur emissions both inside and outside SOx Emission Control Areas (SECAs). The International Convention for the Prevention of Pollution from Ships (MARPOL) has introduced regulations to prevent pollution in marine by fuel and other toxic substances. Stringency in these regulations will drive the demand for Exhaust Gas Cleaning (EGC) technology popularly known as scrubbers. The systems are effective SOx abatement technologies that removes SO2 by 90% and particulate matters by 70%. Rising concerns pertaining to health and environmental effects of SO2 emissions coupled with increase in R&D initiatives toward green shipping will stimulate the marine scrubber systems market growth. In January 2015, the IMO introduced regulation to reduce emission from particulate matters and has limited the Sox emissions across the ECAs to 0.10%. Further, in 2016, the Marine Environment Protection Committee (MEPC), introduced 0.5% limit on sulphur fuel content in marine traffic globally that will go into effect from January 1, 2020. Wet marine scrubber systems market is anticipated to grow over 40% by 2024. Long term operational flexibility coupled with less payback period will encourage the product penetration. Hybrid scrubber systems offer greater flexibility and adjustability pertaining to open and closed loop cycles. In addition, these systems operate in varying water alkalinity which will further boost the product adoption. Dry marine scrubber systems market will grow on account of cost efficiency and low energy consumption. The device does not require any liquid for the scrubbing process but rather uses a dry chemical for removing the SOx compounds. MDO marine scrubber systems market, in 2017 was valued over USD 500 million. High sulphur content levels in heavy fuel coupled with stringent regulations to limit SOx will positively impact the product demand. Acceptance of low cost fuel with scrubber systems to comply with sulphur emission norms will further complement the business outlook. Stringent norms to comply with 0.50% global sulphur cap as defined by IMO along with rising awareness toward technologically advanced systems will boost the hybrid marine scrubber systems market growth. Commercial applications are projected to contribute over 30% to the global marine scrubber systems market share by 2024. Increasing long international voyage coupled with rapid industrialization across the emerging economies will encourage the product adoption. In addition, accelerating demand for retrofitting of existing vessels will complement the business growth. 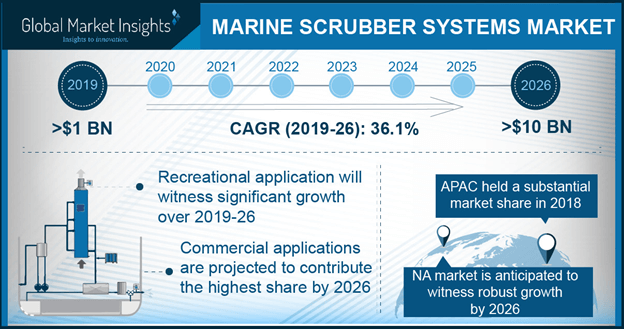 Recreational marine scrubber systems market will grow on account of rising disposable income and increasing investments toward the development of tourism sector. Further, the growing demand for cruise ships owing to comfort and luxury it provides will fuel the industry growth. The U.S. marine scrubber systems market will grow owing to growing concern toward limitation of overall sulphur emission rates along with extensive R&D activities to manufacture sustainable systems. In 2018, in MEPC conference the country strategized to limit the marine pollution from the shipping industry and reduce the ocean emissions by 50% by 2050. In addition, seawaters along Canadian and the U.S. shorelines has been designated as the North American ECAs to curb the sturdy increase in SO2 emissions. Asia Pacific marine scrubber systems market is set to witness strong growth on account of rising seaborne trade activities. Rising awareness toward SOx and its impact on health coupled with strict norms to curb pollution will propel the business landscape. The Chinese Ministry of Transport, in 2015 released an implementation plan to limit the levels of air pollution generated by ships through establishing new ECAs in China including the Yangtze River Delta, the Pearl River Delta, and Bohai Bay. Asia Pacific accounts for over 60% of the global shipbuilding led by China, Japan and South Korea. 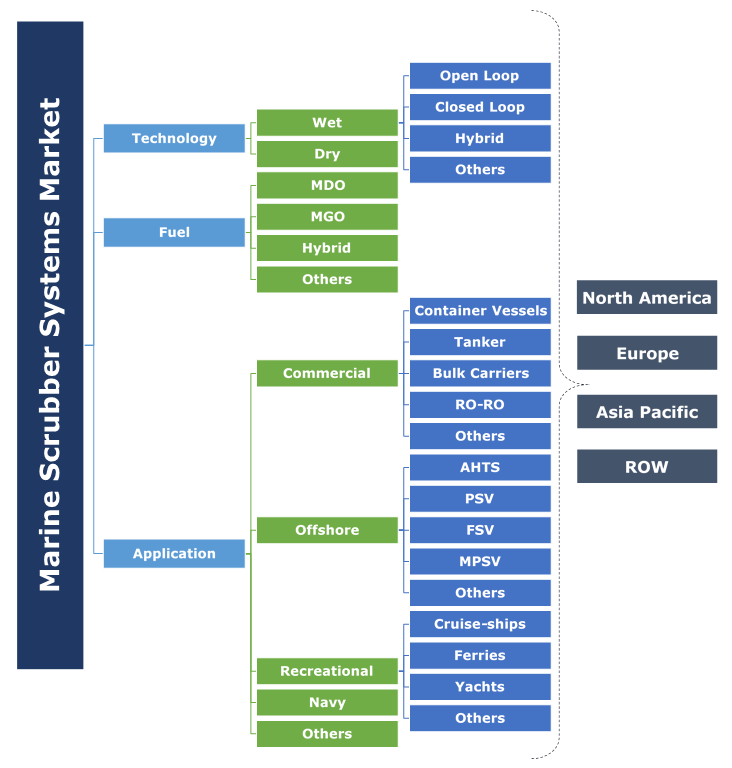 Key industry participants across the marine scrubber systems market includes Wärtsilä, Alfa Laval, Yara, CR Ocean Engineering, AEC Maritime, Clean Marine, DuPont, Shanghai Bluesoul Environmental Technology, Mitsubishi, Fuel Tech, Johnson Matthey, SCL International, GEA, Scheuch Gmbh, Albonair, Kwangsung, FLSmidth, Fuji Electric, Damen and Ecospray Technologies. Industry players are focussing toward product development, innovation, collaboration and research & development to comply with the regulations and mandates by the respective governments or internationally accepted norms. In 2017, Yara Marine has been grated patent for exhaust gas cleaning scrubber technology along with the development of its inlet and mini scrubbers available for varying range of engine sizes. Scrubber systems are the sulphur abatement technologies deployed across boilers and engines to curtail the harmful emissions. Increasing demand for sustainable technologies coupled with wide acceptability by the ship manufacturers will augment the industry outlook. Furthermore, government initiatives toward the use of marine scrubber systems in the coming scenario will foster the industry outlook.